Do you have a child who struggles with anxiety? Many of us have anxieties. For some it is flying in an airplane. For others, it is heights (that’s me), public speaking, or doing “new” things. 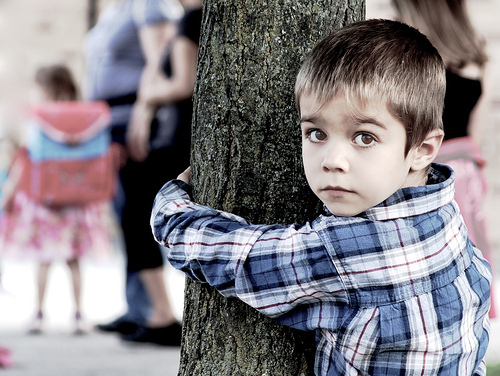 Many children with autism spectrum disorders experience anxiety. For Ryan, anxiety is brought on by experiences in group settings where he worries about not doing well, and meeting with lots of people. These situations remind him too much of school where he saw himself as being unsuccessful. He becomes very nervous, he talks very fast, and I can tell that he is becoming agitated. A recent report from the Centers for Disease Control and Prevention found that 1.8 million children 18 and younger currently have anxiety disorders, and as many as 10% of all children suffer from phobias. Unlike the usual fears of growing up, anxiety disorders don’t simply go away, but must be treated. Some children are treated by seeing a counselor who uses cognitive behavioral approaches to help them manage their anxiety by teaching coping strategies. Ryan will utilize deep breathing, counting backwards to himself and/or picturing a scene that he finds very calming. Researchers at the Mayo Clinic and other organizations are finding that slowly exposing children to the things that are most anxiety provoking can, in a short period of time, eliminate anxiety. There is even an app, the Anxiety Coach, developed by Dr. Whiteside of the Mayo Clinic, to help you manage your anxiety symptoms. Ryan and I are going to give it a try! This entry was posted in Uncategorized and tagged anxiety, autism, children, exposure therapy, therapy. Bookmark the permalink.